Penicillin (abbreviated PCN) is a group of lactam antibiotics used in the treatment of bacterial infections caused by susceptible, usually Gram-positive, organisms. 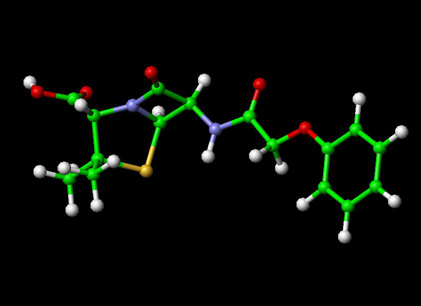 Penicillin is also the informal name of a specific member of the penicillin group Penam Skeleton, which has the molecular formula R-C9H11N2O4S, where R is a variable side chain. The discovery of penicillin is usually attributed to Scottish scientist Sir Alexander Fleming in 1928 and the development of penicillin for use as a medicine is attributed to the Australian Nobel Laureate Howard Walter Florey. Fleming recounted later that the date of his breakthrough was on the morning of Tuesday, September 28, 1928 . At his laboratory in the basement of St. Mary's Hospital (now part of Imperial College) in London, noticed a halo of inhibition of bacterial growth around a contaminant blue-green mould Staphylococcus plate culture. Fleming concluded that the mould was releasing a substance that was inhibiting bacterial growth and lysing the bacteria. He grew a pure culture of the mould and discovered that it was a Penicillium mould, now known to be Penicillium notartum. Charles Thom, an American specialist working at the U.S. Department of Agriculture, was the acknowledged expert, and Fleming referred the matter to him. Fleming coined the term "penicillin" to describe the filtrate of a broth culture of the Penicillium mould. Even in these early stages, penicillin was found to be most effective against Gram-positive bacteria, and ineffective against Gram-negative organisms and fungi. He expressed initial optimism that penicillin would be a useful disinfectant, being highly potent with minimal toxicity compared to antiseptics of the day, but, in particular, noted its laboratory value in the isolation of "Bacillus influenzae" (now Haemophilus influenzae). After further experiments, Fleming was convinced that penicillin could not last long enough in the human body to kill pathogenic bacteria, and stopped studying penicillin after 1931, but restarted some clinical trials in 1934 and continued to try to get someone to purify it until 1940. . In 1930 Cecil George Paine, a pathologist at the Royal Infirmary in Sheffield, attempted to treat sycosis - eruptions in beard follicles - but was unsuccessful, probably because the drug did not get deep enough. Moving onto opthalmia neonatorum - a gonococcal infection in babies - he achieved the first cure on 25th November 1930. He cured four patients, one adult the others babies, of eye infections although a fifth patient was not so lucky. In 1939, Australian scientist Howard Florey (later Baron Florey) and a team of researchers (Ernst Boris Chain, A. D. Gardner, Norman Heatley, M. Jennings, J. Orr-Ewing and G. Sanders) at the Sir William Dunn School of Pathology, University of Oxford made significant progress in showing the in vivo bactericidal action of penicillin. Their attempts to treat humans failed due to insufficient volumes of penicillin (the first patient treated was Reserve Constable Albert Alexander), but they proved its harmlessness and effect on mice. Some of the pioneering trials of penicillin took place at the Radcliffe Infirmary in Oxford. On 1942-03-14, John Bumstead and Orvan Hess became the first in the world to successfully treat a patient using penicillin. A moldy cantaloupe in a Peoria, Illinois market in 1943 was found to contain the best and highest-quality penicillin after a world-wide search.. The challenge of mass-producing the drug had been daunting. On March 14, 1942, the first patient was successfully treated for streptococcal septicemia with U.S.-made penicillin. Half of the total supply produced at the time was used on that one patient. By June 1942 there was just enough U.S. penicillin available to treat ten patients. The discovery of the cantaloupe, and the results of fermentation research on corn-steep liquid at the Northern Regional Research Laboratory at Peoria, Illinois, allowed the USA to produce 2.3 million doses in time for the invasion of Normandy in the spring of 1944. The chemical structure of penicillin was determined by Dorothy Crowfoot Hodgkin in the early 1940s. A team of Oxford research scientists led by Australian Howard Florey, Baron Florey and including Ernst Boris Chain and Norman Heatley discovered a method of mass-producing the drug. Chemist John Sheehan at MIT completed the first total synthesis of penicillin and some of its analogs in the early 1950s, but his methods were not efficient for mass production. Florey and Chain shared the 1945 Nobel prize in medicine with Fleming for this work, and, after WWII, Australia was the first country to make the drug available for civilian use. Penicillin has since become the most widely-used antibiotic to date, and is still used for many Gram-positive bacterial infections. The first major development was ampicillin, which offered a broader spectrum of activity than either of the original penicillins. Further development yielded beta-lactamase-resistant penicillins including flucloxacillin, dicloxacillin and methicillin. These were significant for their activity against beta-lactamase-producing bacteria species, but are ineffective against the methicillin-resistant Staphylococcus aureus strains that subsequently emerged. Î²-lactam antibiotics work by inhibiting the formation of peptidoglycan cross-links in the bacterial cell wall. The Î²-lactam moiety (functional group) of penicillin binds to the enzyme (DD-transpeptidase) that links the peptidoglycan molecules in bacteria, which weakens the cell wall of the bacterium (in other words, the antibiotic causes cytolysis or death due to osmotic pressure). In addition, the build-up of peptidoglycan precursors triggers the activation of bacterial cell wall hydrolases and autolysins, which further digest the bacteria's existing peptidoglycan. Gram-positive bacteria are called protoplasts when they lose their cell wall. Gram-negative bacteria do not lose their cell wall completely and are called spheroplasts after treatment with penicillin. 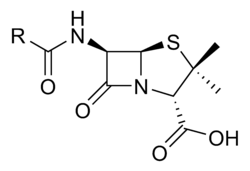 Penicillin shows a synergistic effect with aminoglycosides, since the inhibition of peptidoglycan synthesis allows aminoglycosides to penetrate the bacterial cell wall more easily, allowing its disruption of bacterial protein synthesis within the cell. This results in a lowered MBC for susceptible organisms. Common adverse drug reactions (â‰¥1% of patients) associated with use of the penicillins include diarrhea, nausea, rash, urticaria, and/or superinfection (including candidiasis). Infrequent adverse effects include fever, vomiting, erythema, dermatitis, angioedema, seizures (especially in epileptics), and/or pseudomembranous colitis. Pain and inflammation at the injection site is also common for parenterally-administered benzathine benzylpenicillin, benzylpenicillin, and, to a lesser extent, procaine benzylpenicillin.so as nephritis,infection of the kidney. Although penicillin is still the most commonly-reported allergy, less than 20% of all patients that believe that they have a penicillin allergy are truly allergic to penicillin; nevertheless, penicillin is still the most common cause of severe allergic drug reactions. Allergic reactions to any Î²-lactam antibiotic may occur in up to 10% of patients receiving that agent. Anaphylaxis will occur in approximately 0.01% of patients. It has previously been accepted that there was up to a 10% cross-sensitivity between penicillin-derivatives, cephalosporins, and carbapenems, due to the sharing of the Î²-lactam ring. However recent assessments have shown no increased risk for cross-allergy for 2nd generation or later cephalosporins. Recent papers have shown that major feature in determining immunological reactions is the similarity of the side chain of first generation cephalosporins to penicillins, rather than the Î²-lactam structure that they share. Fleming A. (1929). "On the antibacterial action of cultures of a penicillium, with special reference to their use in the isolation of B. influenza.". Br J Exp Pathol 10 (31): 226â€“36. Brown, Kevin. (2004). Penicillin Man: Alexander Fleming and the Antibiotic Revolution.. Stroud: Sutton. Drews, JÃ¼rgen (March 2000). "Drug Discovery: A Historical Perspective". Science 287 (5460): 1960 - 1964. Krauss K, editor (1999). Yale-New Haven Hospital Annual Report (PDF). Yale-New Haven Hospital. Mary Bellis. The History of Penicillin. Inventors. About.com. John S. Mailer, Jr., and Barbara Mason. Penicillin : Medicine's Wartime Wonder Drug and Its Production at Peoria, Illinois. lib.niu.edu. Silverthorn, DU. (2004). Human physiology: an integrated approach.. Upper Saddle River (NJ): Pearson Education. (2006) in Rossi S, editor: Australian Medicines Handbook. Adelaide: Australian Medicines Handbook. James, PharmD, Christopher W.; Cheryle Gurk-Turner, RPh (January 2001). "Cross-reactivity of beta-lactam antibiotics". Baylor University Medical Center Proceedings 14 (1): 106-107. Dallas, Texas: Baylor University Medical Center. (2005) "Inadvertent use of Bicillin C-R to treat syphilis infection--Los Angeles, California, 1999-2004". MMWR Morb. Mortal. Wkly. Rep. 54 (9): 217-9. PMID 15758893. United States Food & Drug Administration. "FDA Strengthens Labels of Two Specific Types of Antibiotics to Ensure Proper Use." Published December 1, 2004. Last accessed June 18, 2007. Salkind AR, Cuddy PG, Foxworth JW (2001). "Is this patient allergic to penicillin? An evidence-based analysis of the likelihood of penicillin allergy". JAMA 285 (19): 2498-2505. Solensky R (2003). "Hypersensitivity reactions to beta-lactam antibiotics". Clinical reviews in allergy & immunology 24 (3): 201-20. PMID 12721392. Dash CH (1975). "Penicillin allergy and the cephalosporins". J. Antimicrob. Chemother. 1 (3 Suppl): 107â€“18. PMID 1201975. Gruchalla RS, Pirmohamed M (2006). "Clinical practice. Antibiotic allergy". N. Engl. J. Med. 354 (6): 601-9. doi:10.1056/NEJMcp043986. PMID 16467547. Pichichero ME (2006). "Cephalosporins can be prescribed safely for penicillin-allergic patients" (PDF). The Journal of family practice 55 (2): 106-12. PMID 16451776. Pichichero ME (2007). "Use of selected cephalosporins in penicillin-allergic patients: a paradigm shift". Diagn. Microbiol. Infect. Dis. 57 (3 Suppl): 13S-“18S. doi:10.1016/j.diagmicrobio.2006.12.004. PMID 17349459. Antunez C, Blanca-Lopez N, Torres MJ, et al (2006). "Immediate allergic reactions to cephalosporins: evaluation of cross-reactivity with a panel of penicillins and cephalosporins". J. Allergy Clin. Immunol. 117 (2): 404â€“10. doi:10.1016/j.jaci.2005.10.032. PMID 16461141.